Partisans on both sides of politics often make sweeping claims about the media. Some on the left have claimed that the NZ Herald is relentlessly pro-National and that (for example) John Armstrong is a cheerleader for the government. Others think the opposite. For some time I’ve wanted to try and collate data on the media, to try and ascertain where the opinion of certain editorials and columnists tends to end up, and for the last five months have been doing so. The data below is imperfect,but it is also new – in that we’ve never seen before a comprehensive analysis of the opinion columns of major newspapers and their columnists. It covers five months – from 1 November 2014 to 31 March 2015. It will continue to be published every six months here-after, to see what changes over time – if anything. Data is collated from the NZ Herald and Stuff websites every morning, checking the main pages, news pages, politics pages and opinion pages. It is possible some columns and editorials have been missed if they were not on the websites until later in a day. However if seen on subsequent days they are added to the table. Where a journalist or columnist has done fewer than three columns that reference the Government or political parties, they are not included in the five month summary below, but they may be included in summaries over longer time periods. An editorial or column is assessed against whether someone reading it will feel more positive or more negative about the Government/National, Labour, Greens or NZ First. If an editorial or column is not on a political issue, or just talks about an issue in a way that is neither supportive nor critical of a party, then they are not included. This is just an analysis of columns and editorials that are positive or negative for a political party or the Government. What may be interesting is the relative difference in tones between different columnists and editorials, and also as this gets repeated in six months, what differences over time there are. Turning first to the editorials of the three metro newspapers (only they were included), the Dominion Post is the most relentlessly critical of National. Of 24 editorials referencing the Government or National, 22 are critical and only 2 supportive, so 92% negative. The Herald is close with 79% negative and 21% positive. Hard to see how some people claim it is a pro-National newspaper. The Press has had only six editorials about the Government or National – four positive and two negative. Turning to the columnists, the one who has written the most critical of National is Dita de Boni with eight negative and no positives. Andrea Vance is next with 7-0 and then Tracy Watkins, Brian Rudman, Peter Lyons and Duncan Garner. Of those with a mixture of positive and negative, John Armstrong is 84% negative, Rodney Hide 80%, Vernon Small 80%, John Roughan 67% and Fran O’Sullivan 64%. Of interest is there is no columnist in the Herald or on Stuff that is 50/50 or mainly positive about the Government. Combining columns and editorials, the Herald website is 81% negative and 19% positive in its opinion, while Stuff is 85% negative and 15% positive. Fewer columns and editorials on Labour. The Herald editorial has been 60% positive and 40% negative on Labour while the Dominion Post 25% positive and 75% negative. 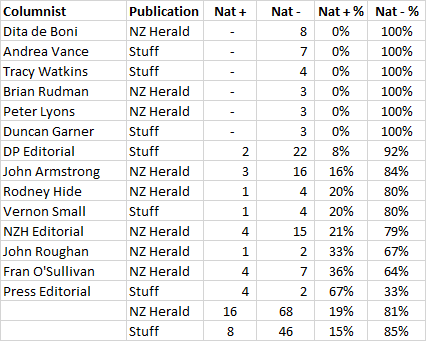 The most supportive columnists have been Fran O’Sullivan (100%), John Armstrong (80%) and Audrey Young (67%), while Vernon Small has been 43% positive and 57% negative. Overall in the NZ Herald the editorials and columns have been 74% positive for Labour and 26% negative. For Stuff it has been 33% positive and 67% negative. 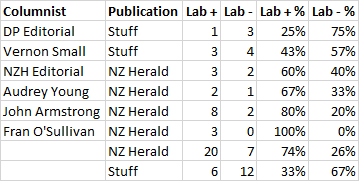 Data has been collected on Greens and NZ First mentions, but not yet enough to publish. Hopefully in six months. Note again this is not a study of bias, but of opinion. It is also only a five month snapshot. Just because (for example) Fran O’Sullivan wrote three columns positive towards Labour and none negative in this time period, doesn’t mean the same will apply for other time periods. This is why the study will be on-going. It’s too early for conclusions, but some interesting observations are that the data doesn’t back up some common beliefs. It is no surprise that Dita de Boni is relentlessly critical of the Government, but somewhat surprising how critical John Armstrong has been. The assertion that the Herald is pro-National is not supported by their own editorials. The Dominion Post used to be seen as having a centre-right editorial line, but in the last year or so has been a profoundly centre-left editorial line. I understand Anthony Hubbard is now the editorial writer, which would explain the dramatic shift. Some on the right say Vernon Small is very pro-Labour. Well he writes the most about them, but seems to be the most balanced about them. Allan Gray Australia has cut its stake in APN to about 15.5% from 17.7%. Miller said the delay wasn't due to a lack of investor interest, but rather waiting for the benefits of consolidation to get the best price.